Heelbo® Foot Elevator. Octagonal design maintains space between heel and bed, preventing skin break-down. Dense polyurethane foam resists bottoming out. 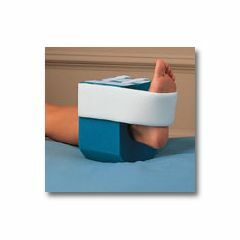 Adjustable plantar strap secures the foot, maintaining proper foot position. Permanently attached fasteners are guaranteed not to fall off. Latex free.